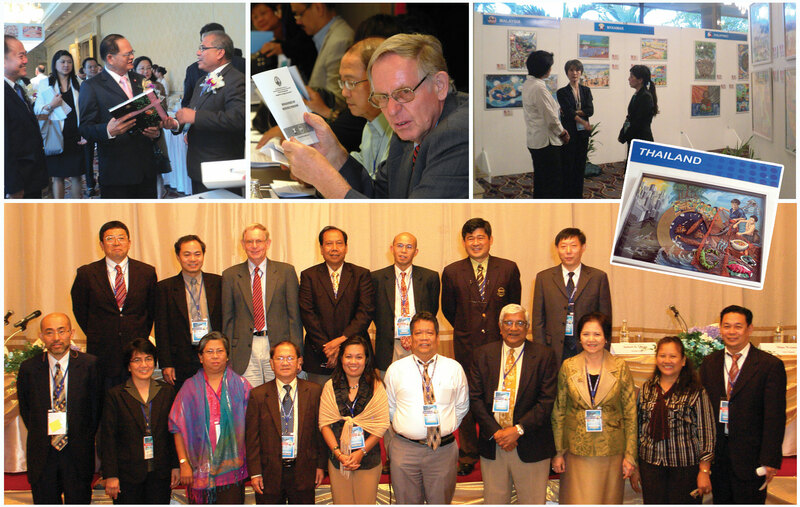 (CLOCKWISE FROM LEFT) The SEAFDEC Secretary-General and the Thai Department of Fisheries Director-General at the booth of Lao PDR; the aquaculture session; the exhibit of children's drawings from the 11 member countries, inset is the work of 15-year old Pim Sub-arnaek; and some of the resource persons and panelists for aquaculture, including AQD Chief Dr. JD Toledo (first row, second from right) who reported the outcome at the final plenary session. AQD begins new work program after the conclusion of the ASEAN-SEAFDEC Conference on sustainable fisheries for food security towards 2020 that was held 13-17 June 2011 in Bangkok, Thailand. With partner institutions, AQD will focus on thematic areas, from ensuring quality seed supply to meeting social & economic needs of SEAFDEC member countries. For more information, you may view the ministerial session’s joint press statement here. Also view the Plan of action on sustainable fisheries for food security for the ASEAN region towards 2020.